Adjust two oven racks to the middle positions and preheat to 200 degrees. Line the bottom of two cookie sheets with parchment paper and set aside. Place egg whites in the bowl of an electric mixer and beat at medium speed until they become foamy, 30 to 45 seconds. Add cream of tartar and increase the mixer speed to medium-height, beating until the egg whites quadrupled in size. This may take 1-1/2 to 2 minutes. Slowly add half of the sugar, being careful to just sprinkle it in. Once incorporated, reduce the mixer speed to slow and sprinkle in the remaining sugar until incorporated. Using a spoon, evenly distribute the meringues into 6 heaping dollops on each cookie sheet so that they are about 1 inch apart. Gently press the back of the spoon into the center of the mounds to create nests of meringue, make sure not to push through to the parchment paper. 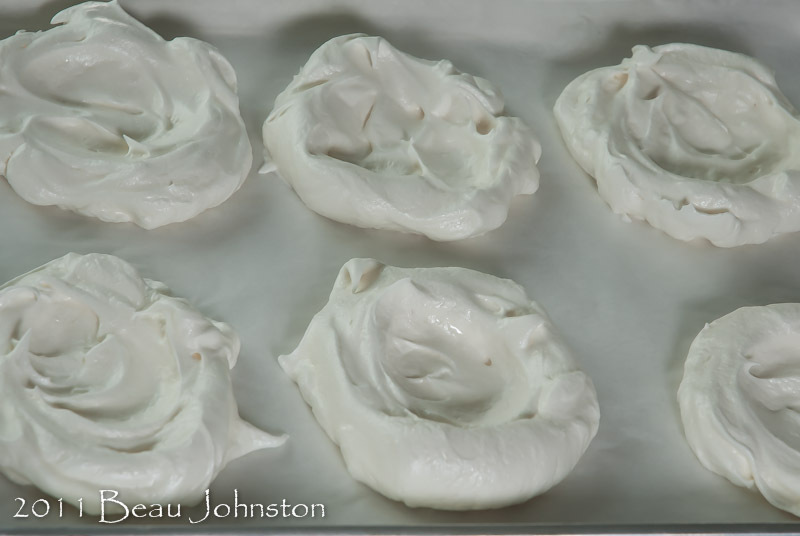 Bake for 1½ hours or until the meringues have smooth, dry, and firm exteriors. Turn the oven off and allow the meringues to cool in the oven for several hours. Once cool, store the meringues in an airtight container, where they will keep for a couple of weeks, until ready to use. Make the meringue nests at home and store in an air-tight container. Save water in camp by washing the fruit at home. Whole strawberries and peaches should be brought to camp and cut while there to maintain the freshness and texture of the fruit. Remove stem from strawberries and quarter into spears. Slice peaches into 1/4" wedges. Using a saucepan lid as a double boiler melt the chocolate and equally drizzle 1/2 onto the meringues. 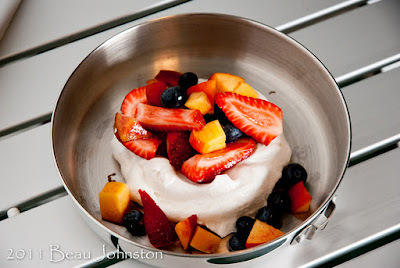 Equally distribute the fresh fruit onto each of the meringues and drizzle remaining chocolate over the top.